Guest post from Victoria Hassid, one of our newest staffers, who found a new reason to be inspired after coming on board with the campaign. As a graduating law student last fall, I began to feel restless. I had entered UC Davis with a reasonable tuition, during a good economy, and I was on track for a career in a prestigious field. By the time I left I faced rising student fees, taking on larger student loans as I tried to figure out how I would get a job in a bad economy. There was no end in sight, and it felt like I had no control over the situation. During the past year I often times felt saddened and frustrated by the situation in our state, including the increasingly expensive education system and the lack of optimism among Californians. 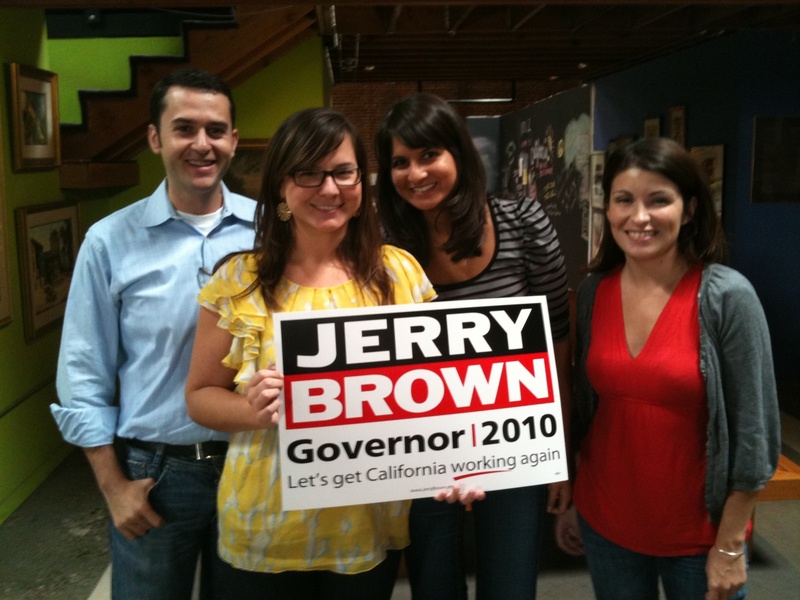 I realized I had to seize an opportunity to channel my frustration into something positive – by getting involved in Jerry Brown’s campaign for governor. Since I started volunteering a few weeks ago, I have developed a sense of hope and pride that I haven’t felt in a long time. Jerry’s ideas and our campaign make me feel that California can get back on track. I know he has both the experience and the tools to make the changes we need and sort through the tough decisions our state faces as we navigate our way through the recession. I know I am not alone in feeling frustrated. Every day I talk to supporters across the state who share in my frustration, and also my restlessness. But they also share the feelings I have about Jerry: That he is the candidate who truly understands, and can solve, the complex problems facing California. So many people want to help out with our efforts, but they either don’t know where to start. That’s why I’m so excited for Jerry’s Day of Action this weekend. On Saturday, supporters will gather in locations all across the state to make sure come November 2, we have a governor who can get California back on track. We plan to hit the pavement by dialing up potential voters, registering everyone we can, and knocking on any and all doors to make sure that all of our friends and neighbors know what’s at stake in this election. Donating a few hours of your time this Saturday can make all the difference for those who want a California that works. We need your help to elect a governor who generates jobs, works to improve schools, and cares about the environment. Find events in your area here. Meg may have money power, but we have something better—people power. And that’s precisely what we need to show in full force this weekend. It will only take a few hours to register voters, educate your neighbors about why Jerry is the right choice for governor, and meet fellow supporters where you live. It’s time to take your concerns and frustrations and turn them into action. Money doesn’t make the difference. People make the difference. We look forward to seeing you at one of our Day of Action events. Staffers at the office, from left: Colin, Christina, Nicole, and Victoria.